One simple way your students can make an impact on Earth Day is through Pennies for the Planet! With this free program from Audubon, your class collects pennies to help amazing animals and interesting habitats around the country. Every student can contribute! Visit www.togethergreen.org/p4p/educators.aspx to find free activities, videos, and much more. Already started your Pennies campaign? Send in your donations by May 5, 2012, to be eligible to win an Audubon BioBash at your school! Click here now! New! Free scissors from Westcott! Sign up at www.themailbox.com/westcott, and you’ll receive a free pair of Westcott Kids Scissors PLUS a free gift. (I won’t spoil the surprise, but it’s a great gift!) Then you’ll have a chance to create a school supply list online; it’s quick to do, and when you submit your list, you’ll be entered for a chance to win an iPad or Westcott school supplies for your entire grade! You can even earn bonus contest entries by sharing the contest with friends and colleagues. These scissors will go fast, so sign up for yours today! Click here! Are you ready to take the Prang Challenge? Teachers across the country are getting the chance to test Prang art markers and see how they stack up. Eight lucky teachers will win $400 in art supplies and a digital camera! Enter for your chance to take the challenge; visit www.themailbox.com/prang! April is National Poetry Month! Are you ready to “Shel-ebrate”? Visit shelsilverstein.com and click on “Ideas for Teachers & Parents.” You’ll find dozens of free activities, worksheets, “Shele-bration” tips, games and puzzles, and a 2012 Poetry Month event kit. Check it out! Planning ahead for professional development? Lesley University offers convenient and timely Advanced Professional Certificate programs that are completely online. Programs cover math, science, instructional technology, autism spectrum disorders, K-12 online learning, and more. Click here now to get the scoop or visit lesley.edu/info/lm. Have you heard about Espresso Elementary? This subscription-based website provides cross-curricular, multimedia resources, including video clips, games, printables, and more. To sign up for a free 30-day trial, click here. To enter to win a one-year subscription, click here! The materials are for PreK through grade 5. There are so many wonderful things about watermelons—and here’s one more! 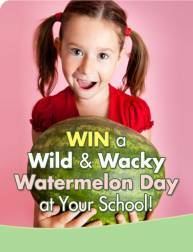 One lucky teacher will win $1,000 to host a Wild & Wacky Watermelon Day party at her school! Plus five runners-up will win $100 to hold watermelon-themed events in their classrooms. Enter now at www.themailbox.com/watermelon or click here. Once you’re done loading up on all these fabulous offers, don’t forget to submit a comment to our blog for your chance to WIN! PS: Contest ending soon: enter to win a die-cutting machine and dies from Ellison! This prize is valued at $1,200. The contest ends this month, so enter now! So much to choose from. The watermelon day of course. What fun. And of course poetry month. I love to celebrate things and am looking forward to Earth day Monday. I would love to win a Wild & Wacky Watermelon Day! How much fun would that be? My favorite without a doubt is the watermelon party. who wouldnt love to kick off summer with a party for the school. The runner up money would do the same on a smaller scale for our preschool classes. How bout it? I look forward to Poetry Month each year, and the main reason is the poetry of Shel Silverstein. His poetry keeps my second graders reading, laughing, and thinking. The website, shelsilverstein.com, is a great resource. I use it mainly for the reproducibles and games. It is especially awesome to listen to the late Mr. Silverstein read some of his poetry in the games section. Last year I put Westcott scissors on my supply list and they sent me a couple pair free for this. It was great to get something to try in my classroom for free and many of my students bought them. I wish more companies would do this! These things sound great. I’d love to try some Prang products. It is fun to take chances for things. I like the westcott scissors, Prang challenge and best of all the Ellison machine and dies. I would love to win a watermelon party for my class. We are having a puppet show outside in our outdoor classroom for our students and their parents and everyone would love to have watermelon afterwards. I love to win things, especially for my classroom.